Famitsu has made public the top 100 best selling games of 2011, the list tracks games released from December 27, 2010 to December 25, 2011. 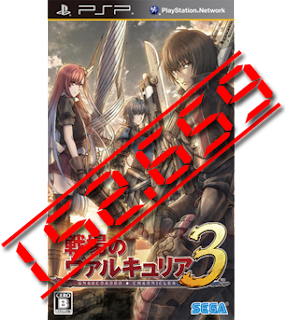 Senjou no Valkyria 3 ranked at 76th position of the list with 152.659 units sold. The game was released on January 27, 2011, this means that the game sold that amount of units in 11 months. To this numbers we have to add the digital sales and also the digital and retailer sales of the Extra Edition released in November of the last year. Numbers are unknown, but as I reported some time ago the retailer version of the Extra Edition sold less than 13.000 units after 5 days on sale, the game ranked in position number 28 that week and the next week was already gone from the top 50 best selling games chart. I think is safe to asume that between the retailer and digital versions of the regular game and the Extra Edition, the game has sold around 200.000 copies, is that good?, I really don't know, sales are better than the ones from Senjou no Valkyria 2 but some people think that the reason Sega released so quick the Extra Edition is because they were unhappy with the sales of the regular game, but to be fair they released the budget version of Senjou no Valkyria 1 and 2 very quick too. Time will tell if the sales numbers are good enough to keep the franchise alive. Thanks for the update! I think it's safe to assume we'll be getting a VC4 sometime soon. My guess it would be a full blown console sequel too since one of the reasons we've been getting these portable games is because they said they wanted the next console one to have a significantly enhanced system. The improvements they've made with VC2 and 3, plus whatever else they have in store, makes me think they'll be ready for the next one to be on a console. Thanks for the info! I Hope VC4 comes to PSVita or PS3. I think 150-200k made VC3 profitable enough. If you take the example of Hyperdimension Neptune, the 1st one sold 70k in Japan and had a sequel. Both games were localized for the West. Do you have the link for Famitsu's top 100? Stay tunned for Extra Edition sales, I found them. Hint.... they are very low. Ryuzaki, if you consider it strictly in terms of retail sales The Last Story did out sell VC3, but only in retail since The Last Story was not sold digitally. The one thing that worries me, despite the decent sales of VC3 (which seem consistent with the last two games), is that Sega Wow didn't develop VC3, it was Media.Vision that did. It makes me wonder, along with a rumour I heard that Sega Wow has moved on to develop other games, that this could be the last game of the series. Bozz, I'd be interested in hearing more about this rumor. Do you have a source? I'm not doubting the validity of your claim, I'm just genuinely interested. Even if Sega Wow is no longer going to develop VC, that doesn't necessarily mean that the series will end. Despite Media Vision being the developer for VC3, the game was still produced by Shinji Motoyama, the producer of VC2. If Media Vision took on development of the series thus far, based on VC3's acclaim, I think many fans would be happy with that. So I wouldn't get worried about the series ending just yet. They really went all out with the VC3 anime and the merchandise tie-ins, I don't think the series will be ending just yet. Someone mentioned it on the Valkyria Chronicles fan page on Facebook, apparently it dates back to last February. The rumour also mentions Sega Wow working on a Shining game (probably referring to Shining Blade). Also take into consideration that the intent of the series being released on the PSP was to expand the fan base, since the sales are consistent that doesn't bode well for their hopes to increase the fan base. There is also a link to the video for the new Shining Blade game. You can definitely see how similar to VC it looks. Yeah, I posted that thread on gamefaqs. Interesting responses in there from fellow VC fans.